he program focuses on the role of numerical analysis, simulation and scientific computing for understanding and illuminating our complex world. 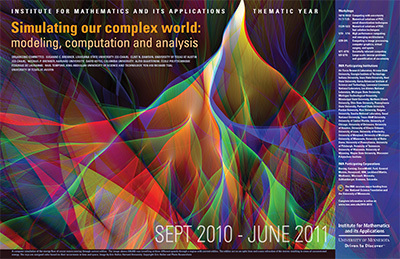 The development of computational methodologies and framework has been a mainstay of the applied mathematics community for more than 50 years. The IMA has not sponsored a program in this general area since the annual year in High Performance Computation in 1996-97. We feel that the time is right to revisit this topic, and the broad community that it represents. The annual year outlined below will broadly survey and sample current activities in this field, ranging on one hand from purely mathematical developments regarding numerical algorithms, numerical methods and reduced order models; to developments triggered by changing computational infrastructure and high performance computing; to prominent issues arising in large computations with substantial uncertainty. Approximately one third of the year will focus primarily on application areas where these mathematical ideas have (and will continue have) great impact. We will focus first on computing problems with societal importance, and secondly, on computing in sports and the arts. Simulating our Complex World will be organized around seven workshops. Each workshop will contain a mixture of mathematical analysis, practical analysis and applications; the specific emphasis will shift throughout the year but the goal is to keep different facets of the subject wholly engaged at all times. The kick-off workshop on computing with uncertainty will provide a broad overview of many of the important computational problems of today, in the context of the general question of how to quantify and manage uncertainty on the ever larger computations that are required for solving the problems that computers are being asked to solve. As is traditional, the annual year will have as foundation a group of long-term visitors and postdocs, as well as a mixture of intermediate and short term visitors. Each workshop will be preceded by a 1-2 day tutorial outlining the main ideas of the workshop, to make it accessible to a broader audience. The topic of the annual year lends itself very well to strong participation with industry and the national labs, and it is our intent to facilitate their vigorous involvement in the workshops. Indeed, many of the workshop topics are themselves of central importance to the national labs, and it is our hope that this will lead to strong and productive interactions.